I realize it isn't time that one needs to heal and grow. Time is used to simply measure our growth and choices, and whether a moment passes, or a decade, the same choices can be made. There is no correct amount of time for personal discoveries to occur. I believe it takes an entire lifetime to achieve certain things. My recent decision to move to New York has fascinated me in countless ways. It had been two years since my separation with my ex-husband, and I had completely moved on from the drama that had come along with it. When I was able to accept that period of my life as a huge opportunity to grow, I was able to truly move forward and make new dreams for myself. Two years later, I type this in my Brooklyn apartment. So much of me wishes I had come sooner, but I needed to figure out a lot of things for myself in Seattle, first. With this move away from home, the relationship I now have with myself has begun to evolve. It isn't time, or a plan from the universe that I need for this new chapter. It is purely a personal choice to listen to my heart and intuition, and live with less fear. The fear of leaving Seattle, and essentially my entire world, turned into fascination. This has helped me to be more in touch with my true-self. And I really like the Kristen I have grown into. I feel a courageous and kind love for myself. I now see a reason to love all of the difficult things that has happened in my life. All have given me the chance to grow my heart and mind into what they are now. 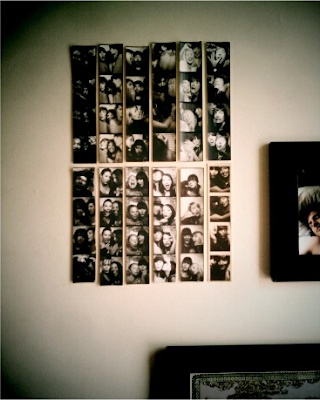 *above photo: A selection of my many photo booth pictures hung neatly on the wall of my bedroom, in Brooklyn.